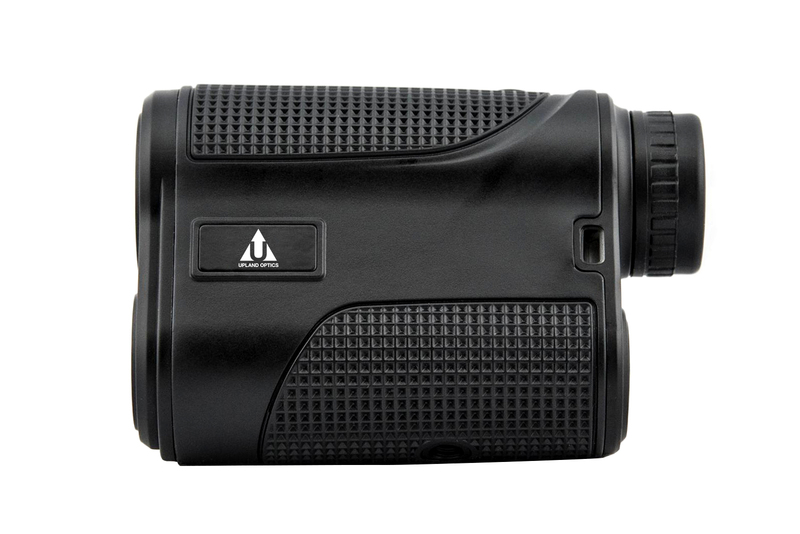 The Upland Optics Perception 1000 is our favorite rangefinder. Click the picture above to learn more. Rangefinders belong to an innovative class of technology that has been evolving over the last century. These handheld gadgets are useful in a variety of situations. The system itself arose almost one hundred years ago, primarily adapted alongside cameras. In recent decades, these helpful tools have been utilized for solo performance in a variety of fields. They offer great benefits for hunting, archery, and golf. This technical guide explores the vital specifications of these revolutionary devices. Before detailing the essential characteristics of a sound rangefinder, we will present the best ones available on the current market. While the functional mechanics remain relatively identical, minor modifications allow these machines to be employed for a variety of different purposes. Upland Optics is the brand we recommend the most for hunters, and their all new rangefinder is a perfect example of why. Simple and effective, this device is built to be rugged enough to handle the extreme conditions that hunters often face. With an effective range of 1000 yards, this rangefinder will be dialed in on distances well outside the effective range of most hunters. You will always know exactly how far of a shot you are taking or how much distance you have to cover to get within range. Lightweight and portable, the device isn’t even noticeable when added to your other heavy gear. I personally carry it on my chest attached to my binocular harness, making it very easy to access quickly. Click here to see the current price. This bestselling device from Nikon tops our list for a variety of reasons. 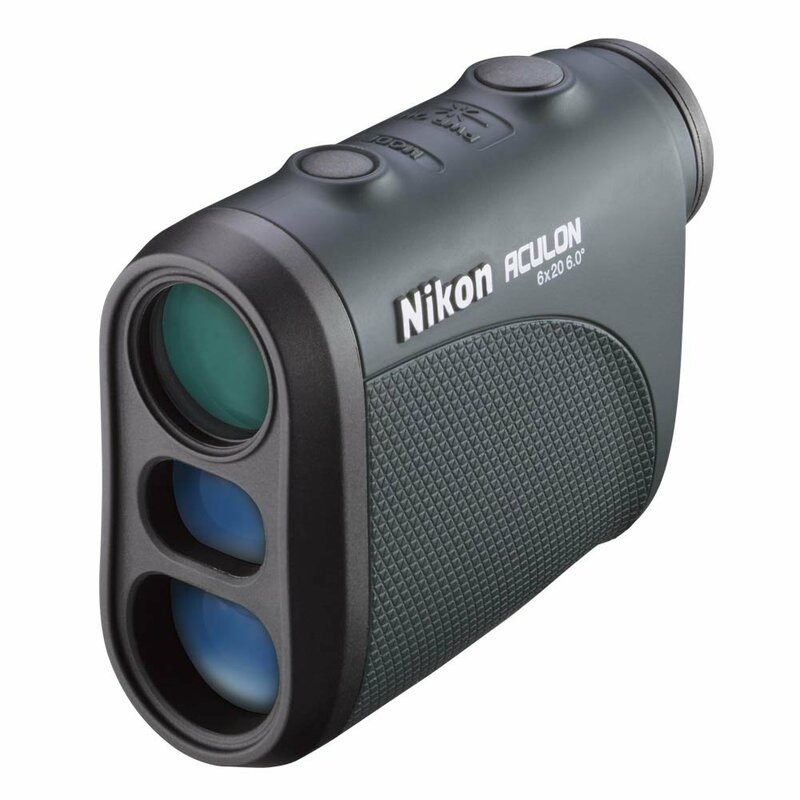 Priced well below the higher end rangefinders, the Aculon is perfect for someone who doesn’t need ultra high-end features, but still wants to get the job done. With a range of just 550 yards, others on this list have far more impressive stats. However, 550 yards is a much greater distance than most hunters can safely and ethically take shots. Another huge benefit of this device is how easy it is to use. The user friendly design allows for an accurate read with a push of a single button. It also is small and lightweight, making it easily portable. 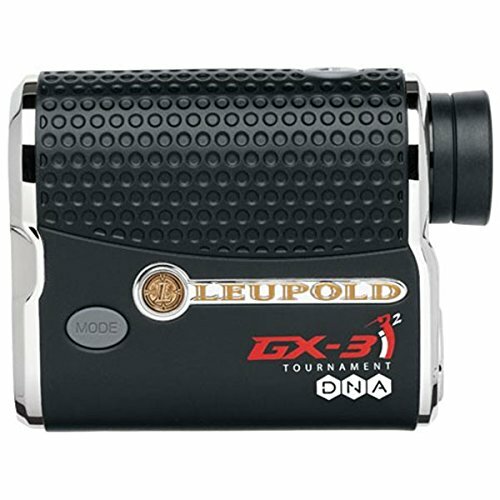 Available in gray or Xtra Green, this compact range finder is an excellent option. Click here to see the current price. 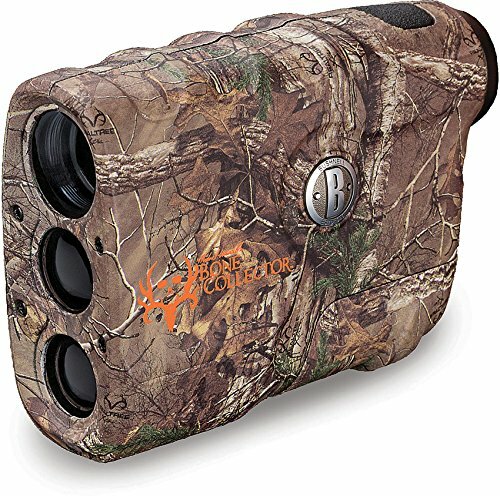 For an authentic hunting experience, experts recommend this rugged rangefinder. Bushnell machines always carry a proud legacy, but this Collector’s Edition release is especially unique. The camouflage exterior lends itself to a gritty outdoor lifestyle. This tough appeal is not just for show, either; in fact, this boisterous device is meant to handle extreme environmental conditions. One of the special attributes of this model is its rainproof shell. The compact design also makes it extra portable. This gadget simplifies the hunting experience more than any other machine. All functions have been condensed to a single-button operation. With a magnification versus objective lens ratio of 4X21mm, this viewer can spot anything between 10 and 600 yards. Accuracy is always within three feet. The primary asset of this rangefinder comes in the form of advanced low light abilities. It is known to deliver unprecedented levels of bright crystalline optics in near darkness. Click here to see the current price. Archery aficionados swear by this premiere rangefinder from Nikon. All measurements are very specific. The increments are given for every 0.1 yards or meters. The gadget comes with First Target Priority Mode. This is the main selling point, mainly because it can be used to aim onto really small objects. It is designed to read thin fence posts 100 yards away. The mapping interface also does not falter with close-range distances down to 5 yards. The objective diameter is an ideal 21mm. This machine is durably suited for tough conditions including fog and rain. The 89 degree angular range is truly impressive, and it enables straight shots up and down. An 18.3mm eye relief zone enshrines true comfort. The CR2 lithium battery promises reliable use for extended periods of time. It is water resistant and rainproof, so you don’t have to worry about the elements. Click here to see the current price. To launch arrows a greater distance than the usual hundred yards, archers flock to this notorious Bushnell creation. This is probably the most accurate design currently available in the field. It extends its reach up to 1,300 yards, and the precision is on the dot. The units are given for every 1/10 yards. For the nearest 475 feet, shots are guaranteed to land within 1/2 yard without human adjustments. Everything beyond that marker still promises a single yard range of accuracy. The legendary 6x optics are brilliantly enlivened by Vivid Display Technology. This approach severely boosts clarity and contrast. Another specialized feature that has been built into this machine is Variable Sight-In (VSI). There are three different modes available for the bow and arrow, and each one is sincerely advantageous. Bulls-Eye mode emphasizes sharpshooting, while Brush and Scan focus on panoramic aiming practices. Finally, the machine possesses a powerful protocol known as “Extreme. Speed. Precision.” This software is the most renowned rangefinder mainframe being offered to casual customers today. This stylish piece of machinery can be further enhanced by a tripod, which can be linked into its factory-installed mounting chamber. Click here to see the current price. For archers just getting acquainted with the sport, it is impossible to go wrong with this Simmons model. It combines all of the basics at an astonishingly affordable price. This release earns rave reviews non-stop, especially since this rangefinder brand has a name for swift precision. The magnification of 4x is more than enough for beginners. A tightly compacted vertical layout makes this gadget a breeze to bring anywhere. With a capacity in between 10 and 600 yards, this bold device contains LCD visuals within the view itself. The optics are exceptionally bright and crystal clear, which is surprising for this price range. It is also housed with a superior casing that is resistant to harsh weather situations. Overall, this machine boasts accessibility and efficiency. Click here to check the current price. 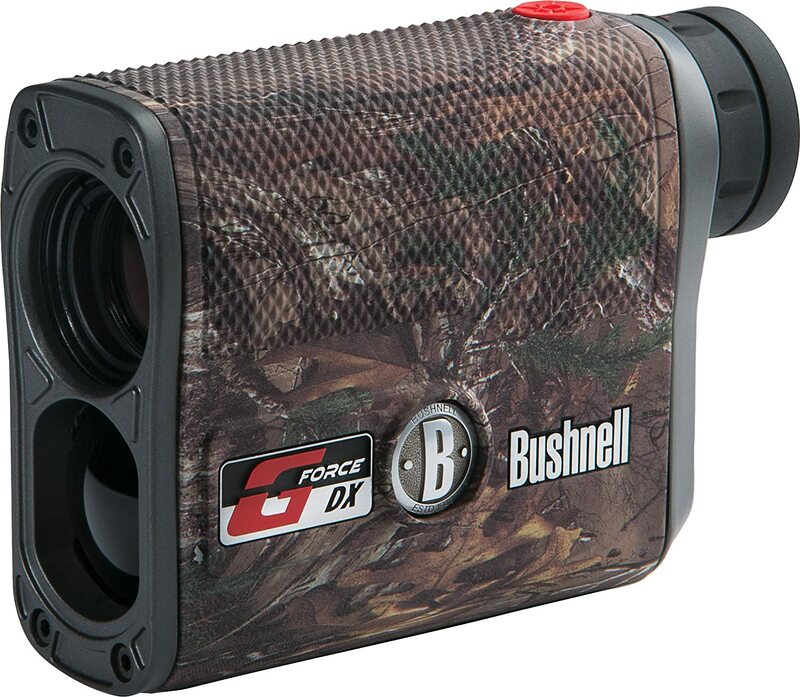 Here’s a go-to rangefinder for bow hunters in the middle ground. This dashing device is equipped with all of the necessary accessories for a successful wilderness excursion. 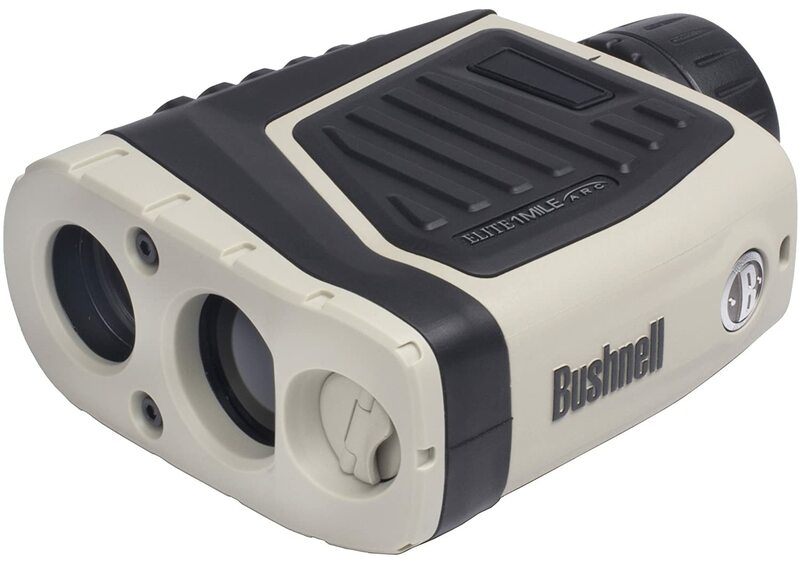 Bushnell’s equipment is especially useful for handling targets in motion, and it tracks distances between 7 and 850 yards. The powerful 4x zoom extends 199 yards, and it grants pure horizontal perspectives. This forceful machine is pocket-sized, and it is equipped with a comfortable anti-slip surface for tight gripping all the time. It has a truly complete angle range that touches 90 degrees on both positive and negative ends of the scale. The Clear Shot interface gives immediate data on every shot before and after it is taken. The precise angle of each arrow is instantaneously provided. This brand always makes the best carrying cases, and the one that comes with this model is no exception to the rule. It also comes with a handy neck strap for rapid access. Click here to check the current price. 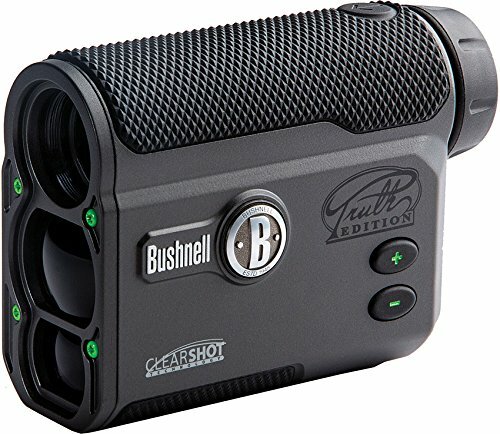 For something a little more powerful than the previous entry, check out this upgrade, which is also from Bushnell. Angle displays are fully tackled by an automated inclinometer. The magnification reaches a whopping 6x, and MOA is fully integrated. This release also contains Bulls-eye, Scan, and Brush, but all specifications are extra detailed. The exterior also boasts the benefit of being handsomely decorated with symmetrical layouts, anti-slip grips and an iconic logo. A lithium ion battery is included, so this product can be used immediately. It is economically savvy and ergonomically sound. This specific model also conveniently includes a dual purpose interface that properly accommodates most guns. Click here to check the current price. Here is perhaps the most extraordinary tool bow hunters have available. 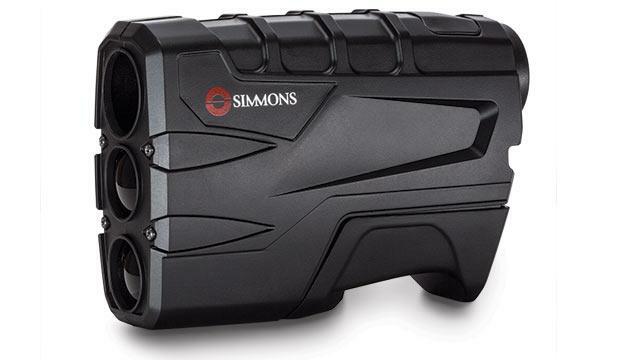 Once again, this rangefinder ditches the traditional monocular approach to enshrine more accuracy, focus and distance. These benevolent binoculars can detect activity up to 1,760 feet away. The rangefinder itself is an Angle Range Compensation (ARC). This revolutionary piece is attached alongside a 96×48 Pixel Matrix Display. Aesthetics blend with functionality, and the PC-3 Phase Corrective Coating is dazzling on both counts. This machine also contains state of the art BaK-4 Prisms to instill total sharpness and crispness for images. Because the conjoined reader retains a minimum of 80% light, it can be used in several dim environments. This light retention rate leads the entire rangefinder industry! Click here to check the current price. 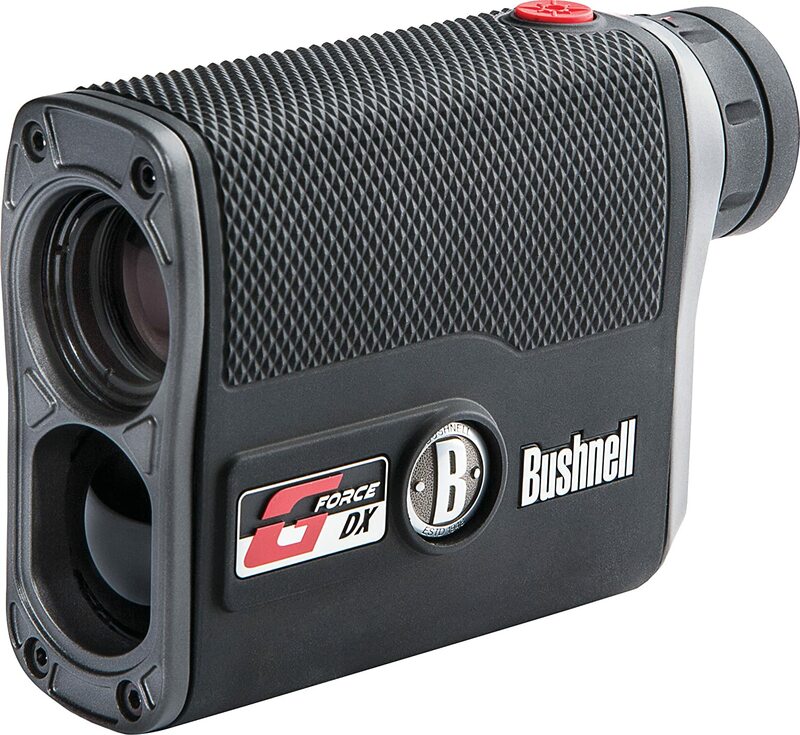 For a truly well-rounded golfing experience, it is hard to top the state-of-the-art equipment that is featured in this mainstay from Bushnell. This is the most popular tool of choice for golfers around the world. Its stylish contour is outfitted with a stellar 24mm objective alongside 5x magnification. This device can precisely calculate ranges up to 1,000 yards, and its minimum distance is a mere 10 yards. With the combo of PinSeeker with Jolt, players can estimate flags within a single yard of accuracy up to a total of 300. The laser is top-notch and completely safe. A sturdy carrying case is provided, and the 3-Volt battery is a standard inclusion. This design features an ergonomic structure that has one of the most stable grips available. A generous two year warranty is granted, and it is legal for official tournaments. Click here to check the current price. If accuracy is your top concern, then check out Leupold’s signature rangefinder. With Prism Lock, it is possible to precisely locate any pin from a distance. Quickness is also a prominent feature of this brand. They often deliver measurements after the very first target return. 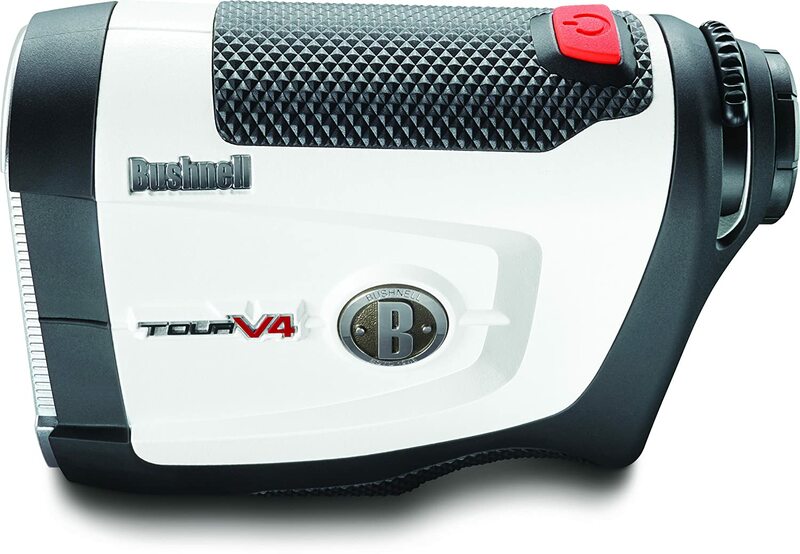 Anyone who plays golf in adverse environmental conditions will want to consider this rangefinder based on its trademark Fog Mode. This feature detects all vital surroundings regardless of environmental conditions or changes in topography. This sleek device boasts refined technical specifications, and its interface is astonishingly accessible. The commands are all very intuitive; plus, it automatically beeps and freezes upon recognizing a properly outfitted flag stick. The grip is suited for intense conditions and the laser is truly beyond comparison. It comes housed in a fine bag that is complete with a protective strap. Click here to check the current price. For a dynamic approach to golfing, it is difficult to beat the simplified technology of TecTecTec!. Crystal clear imagery is a focal point of this gadget, and it is embedded with 6x magnification. Every shot will be within a one-yard accuracy zone up to 540 yards. This tool can completely replace binoculars. Its optic system is a stand-out in today’s industry, especially since it showcases the most evolved digital circuit design currently possible. For golf amateurs, this may be the prime choice. The key to this item’s innovative success lies in its three unique modes. The First Target Priority Mode simply measures distance in regards to the nearest object. Distant Target Priority does the opposite by seeking the farthest object. All of the essential visual data is streamlined immensely, and the view makes it possible to gauge exactly where all hazards are lurking with Scan Mode. Rangefinder equipment for cameras originated in 1916. They were an exceedingly prevalent means of photography for several decades, but single lens reflex (SLR) cameras rendered them somewhat obsolete. Fortunately, the technology lingered on outside of the picture taking field. Today, the rangefinder industry covers a lot of different ground. They are regularly used for land surveying purposes. Many navigation systems rely on them as well. Digital cameras still sometimes use rangefinder technology to instill proper focus for their images. The military is also presumed to use high-tech variations of this hardware, but this information is presently classified. Most modern rangefinders involve some variation of an electronically outfitted monocular. The techniques they use to estimate space can vary widely. 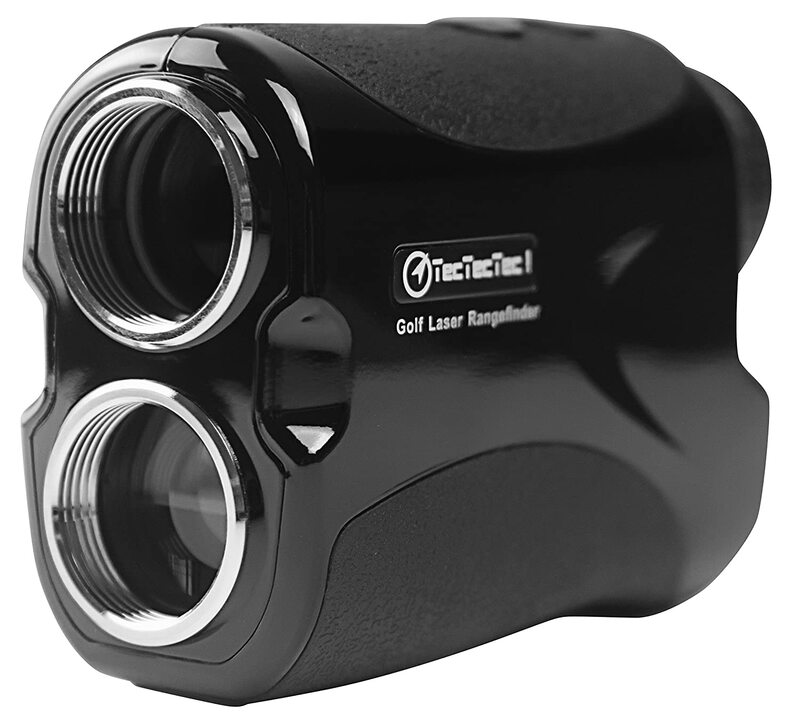 Laser rangefinders are becoming increasingly prominent, but other approaches include ultrasonic, radar, and simple trigonometry. Lasers work by calculating the exact time of flight for each burst of light. Their mathematical determinations are rapid and exact! Meanwhile, radar applies pre-determined numerical figures for quick estimations. For the most accuracy, rangefinder connoisseurs stick with the traditional means of triangulation. With the mere power of sine, cosine, and tangent, this type of standard model can still trump all of its fancier competitors. To convey useful data, a screen is usually mandated. These monitors can come in a variety of forms, but their most common incarnation is liquid crystal display (LCD). Lately, this high-tech inclusion has been structured into the viewing apparatus itself. These visual aids can be used to measure vast distances. The most advanced versions are equipped to detect distant objects. 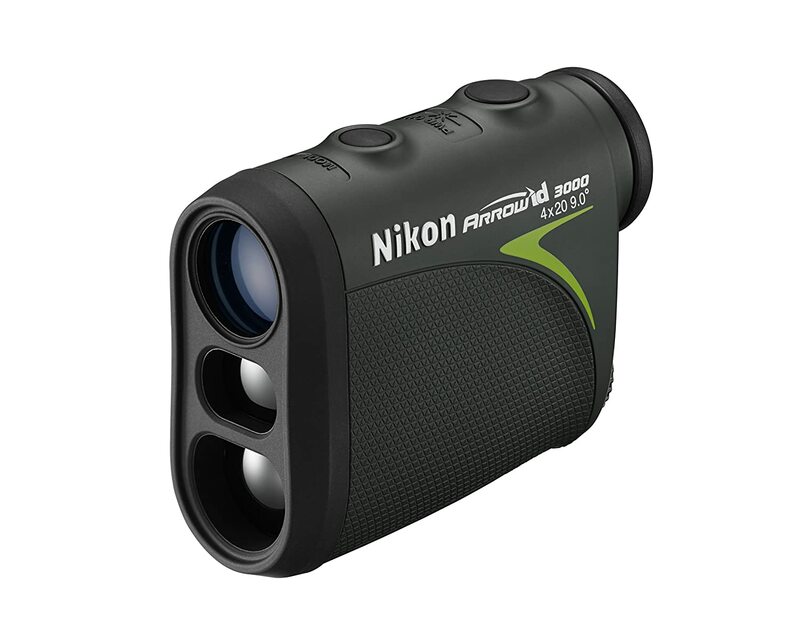 This prioritization over close objects commonly sets hunting rangefinders apart from their golfing counterparts. These devices are equipped with ultra powerful lenses that can accurately capture an entire panorama at once. Sharpshooters often utilize these gadgets to figure out ideal ballistics before firing. This enshrines the zenith of accuracy for every shot. The same is true for archers and bow hunters. Basically, rangefinders are divine accessories for anyone who desires a fuller comprehension of their visual field. This list may be detailed and comprehensive, but it is by no means complete. The truth is that everybody should conduct their own research to ensure that their rangefinder needs are met. Hopefully, this guide is able to help you make a decision in regards to your next rangefinder purchase! Many of the links that you'll find on Optics Den link to products on third party sites. If you choose to purchase a product after going through one of these links, we will receive a small sales commission at no extra cost to you. We thank you for supporting our business! © 2019 Optics Den. All rights reserved.